Recently I've been talking with my class about Art Costa's Habits of Mind, and focusing on one of the 16 each week. One that really resonates with me is 'Responding with Wonderment and Awe'. I remember when I was at university (the first time!) seeing a picture in the National Geographic, taken by the Hubble Space Telescope. According to the description, the Hubble had chosen an area of sky about the size of a grain of sand, that appeared completely empty, and then zoomed in on it for an extended period of time. This is what they saw. Mindblowing. Each speck of light there is a galaxy, containing hundreds of billions of stars. This is a vastness our brains are not really wired to comprehend, and you can only 'Respond with Wonderment and Awe' and feel very tiny. 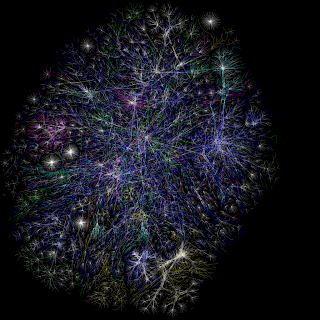 This image is from the Opte Project, who are using special software to 'map' the Internet. It looks to me as though it hasn't been updated for a while, but incredible nevertheless. I have this image on my desktop, and I think most of my colleagues think it's a fireworks display (!). To me it's a visual representation of collaboration and connection on a grand scale. I believe that relative to the future, this image may just be a seedling. Ultimately, when working with Web 2.0 in the classroom, this is what we are teaching our students to navigate and use effectively. And unlike space travel, which takes light years, to get from one end of the Internet to the other only takes a couple of clicks, and there are plenty of black holes on the way. As part of my course I'm reading Will Richardson's book 'Blogs, Wikis, Podcasts and Other Powerful Web Tools for the Classroom'. It has some incredible statistics. He also discusses Wikipedia, which often gets a hard time from critics. Richardson's comments here are worth reading too, particularly regarding the accuracy of Wikipedia. Inspiring indeed. Go forth, in Wonderment and Awe.